I received an order (from my mother) to bake a cake for 100 people last week, and so I spent all week thinking up ways to make a cake that big… Big rectangular cake? Separate cakes? Cupcakes? And since I definitely did NOT want to go with cupcakes (it’s so done, ya know?) 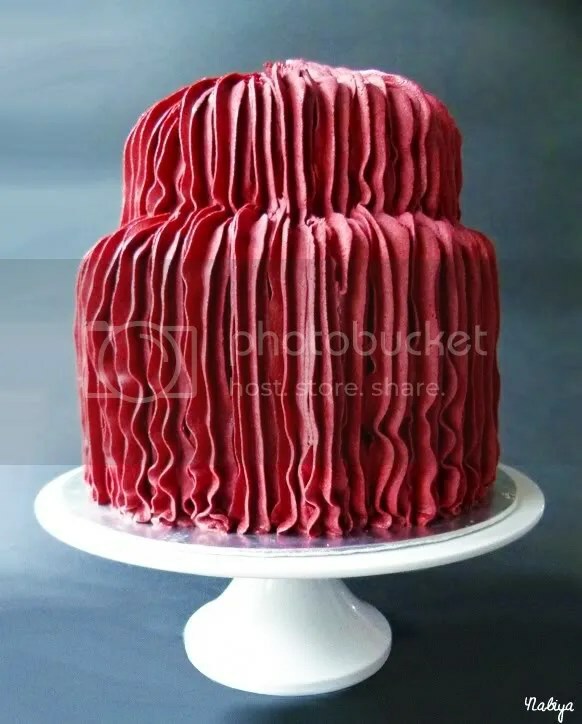 I thought… why not take this opportunity to try making my first ever stacked cake? Yes, ambitious, considering I had just three days to do it. I usually don’t take such late orders, but since it was for my mother and she was buying everything anyway, I thought I’d give it a shot. I read every bit of advice I could find on the net, though I admit to not conducting thorough research on the subject. 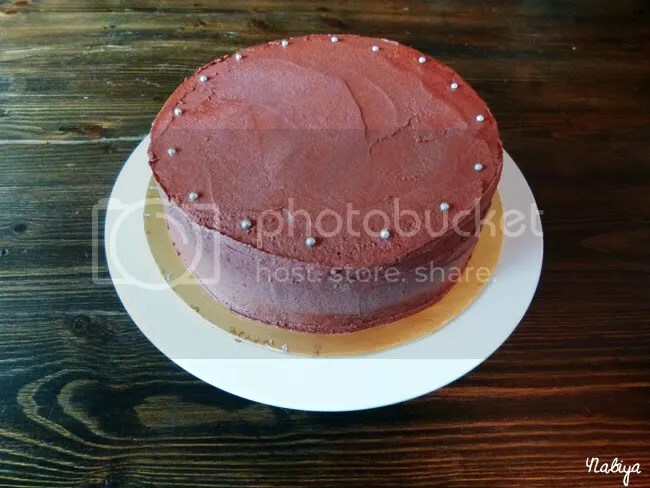 Click on those links for some great cake-making tips though, especially the smitten kitchen link, wowza, is she amazing or is she amazing? It was actually a lot easier than I anticipated, though I kinda underestimated the height of my cake layers and baked too many. 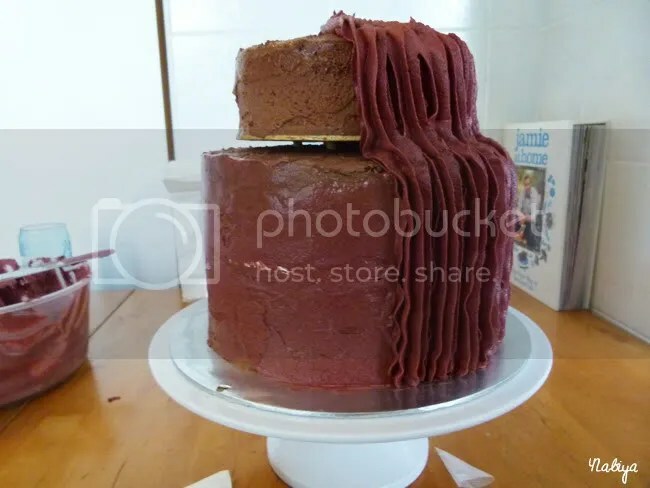 I thought I would need three layers per cake (which would mean a total of nine layers), but when all was said and done… I just needed the basic two. So I had three extra left over in the freezer (show you what I did to them later). I tried a new recipe for this cake, which is silly. You would have thought I’d learned my lesson not to make new recipes for last minute orders by now, but of course not! I don’t have the ability to retain knowledge. It was relatively simple, and turned out quite well! Though not as chocolatey as I had hoped. I baked four batches of this recipe for the cake (though in hindsight, I only needed three), then wrapped them in cling wrap and popped them in the freezer for around two hours while I went out for dinner. When you remove cake from the freezer, you may want to re-moisten the layers with some sugar syrup… or I prefer to use 3 parts hot water, 1 part vanilla essence, and brush it over the layers. For the filling, I had gotten quite lazy and used raspberry and strawberry preserve (raspberry for the top and bottom layers). 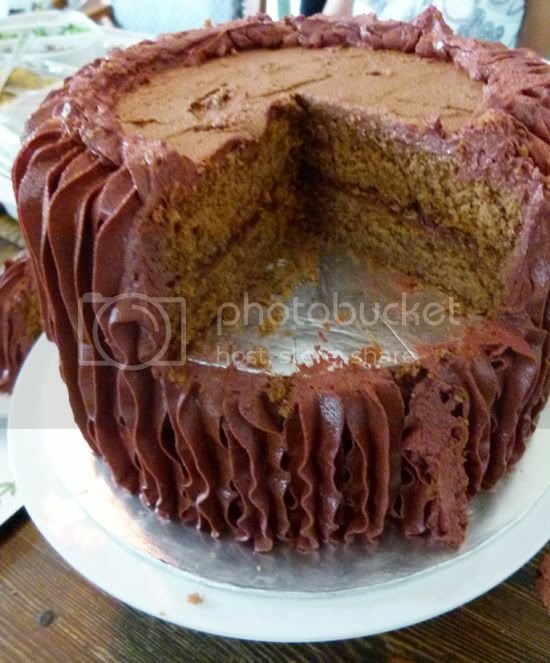 The cakes were then covered with the following chocolate buttercream. For this particular cake, including frosting and the thin crumb coating, I used 1.5 batches of this icing. It turned out quite well, particularly with the bitter-sweet cocoa powder, as it wasn’t as sickeningly sweet as I was afraid it might be. I used a Wilton 1M tip and just drew a line from the bottom of the cake all the way to the top. Check out what it looked like once they’d cut into it. Dear lord. Unfortunately, no matter how careful you are with baking and wrapping and stacking… and as this was my first time… of course my lowest layer didn’t match up with the second layer. I had to patch it up with buttercream, which gave me quite a fright… Then there was the whole process with the dowels, and how they wouldn’t stay even! Those just looked so much more… manageable, to me. The frosting started to scare me a bit, and the longer I stared at it, the more paranoid I became! How on earth was that going to affect my ability to fit into clothes, right? P.S. Sorry if this post sounded kinda weird, it’s just Monday blues, ya know?